A hawkish faction in Prime Minister Ehud Olmert's coalition pulled out of the government on Wednesday, weakening him at a time when he needs a broad base of support for his efforts to reach a final peace deal with the Palestinians by the end of the year. "Negotiations on the basis of land for peace is a fatal mistake," Avigdor Lieberman, head of the Yisrael Beiteinu faction, told a news conference. Olmert spokesman Mark Regev said he had no immediate comment. Ruhama Avraham, a member of Olmert's Kadima Party, said the government would "overcome this." Lieberman's decision came just days after Palestinian and Israeli negotiators began tackling the core issues of their conflict - final borders, sovereignty over disputed Jerusalem, and Palestinian refugees who lost homes in Israel during the war that broke out following the Jewish state's creation in 1948. He had repeatedly threatened to leave the government if these issues were broached. "If we pull back to the 1967 borders, everyone should ask himself, what will happen the following day," Lieberman said. "Will the conflict stop, will the terror stop? Nothing will change." The withdrawal of Yisrael Beiteinu's 11 lawmakers from the government means Olmert still has a majority of 67 in the 120-seat parliament. But the ultraOrthodox Shas Party with 12 lawmakers has also threatened to leave if Israel agrees to any compromise over Jerusalem, whose eastern sector Israel captured in the 1967 Mideast war. Palestinians claim east Jerusalem as the capital of a future state. Israelis and Palestinians relaunched talks after seven years of violence at a U.S.-sponsored Mideast conference in November. The leaders pledged to try to reach an agreement before Bush leaves office a year from now. Olmert had tried to persuade Lieberman to stay in the government in a meeting with him on Tuesday. 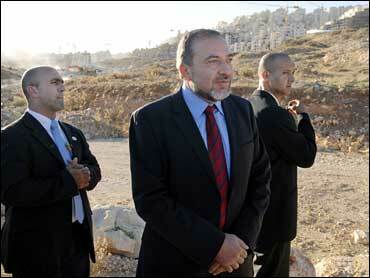 But Yisrael Beiteinu decided in a meeting Wednesday to leave, Lieberman said. "Nothing will come of these negotiations," he declared. Israeli forces were on their way Wednesday to evacuate two settler outposts in the West Bank, officials said, amid U.S. insistence the encampments be eliminated to pave the way for a peace deal with Palestinians. The outposts consist mostly of tents and have no permanent structures, Israeli defense officials said on condition of anonymity because they were not authorized to talk to the press. At least one of them, Shvut Ami, has been evacuated several times in the past. As part of the renewal of Israeli-Palestinian peace talks, President Bush pressed Israel last week to evacuate dozens of outposts. Israeli aircraft struck at Palestinian rocket launchers in the northern Gaza Strip on Wednesday and Islamic militants sent barrages of rockets at southern Israel, a day after 19 Palestinians and a foreign worker in Israel were killed in fierce fighting. Four militants on rocket-launching operations against southern Israel were wounded in two Israeli airstrikes, medics said. In farming communities in southern Israel, the siren warning of rocket attacks rang repeatedly Wednesday morning as 21 rockets and mortars were fired, the military said. No serious injuries or damage were reported. Militants said they fired dozens of rockets and mortars toward Israel overnight. CBS News correspondent Robert Berger reports that in the West Bank, Israeli troops killed the Islamic Jihad's top commander, who had been wanted by Israel for years. Israeli troops killed a son of Gaza's most powerful leader along with 18 other Palestinians on Tuesday in the bloodiest day of fighting in the coastal area since Hamas militants seized control last summer. As fighting raged in Gaza, a Hamas sniper shot and killed an Ecuadorean volunteer working in the potato fields of an Israeli border farm. That killing, and Tuesday's high death toll, stoked the flames of violence at a time when Israel and Palestinian moderates are making halting attempts to talk peace.